Interesting that Facebook and Homeland Security share this software... What a coincidence... Hm. Zuckerberg is clever, he gets paid for this. Facebook have a tendency to change the standard default settings and not inform you. i.e, how many use the https setting rather than the regular http default setting? I avoid all apps, sadly..it appears many people love sharing their and your info quite freely. 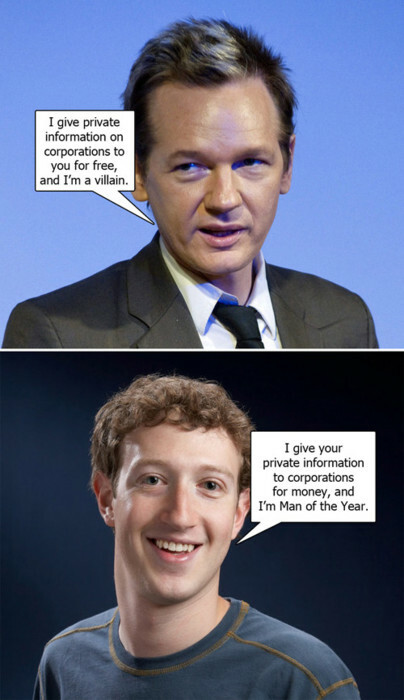 Assange does not hide his political motives, but he is a shady character himself. Though I'm quite looking forward to the next round of big leaks, if the rumours are true. Or for someone to crack his 'insurance policy', though that should be close to impossible. I have little regard for the powers that be..but as I have no better solution to offer, I don't tend to engage in activism. Its' always a matter of the lesser of 2 evils. Agree with both to be honest - both fair comment! This is a good guide to set your privacy levels on facebook. Scroll over the "best practice overview" and adjust each setting.